Clients and techs both prefer a nail enhancement that stays stuck on nails for long wear, without pulling up! If you’ve had problems with lifting, acrylic ratios, or application, check out these ten tips. 10.) Use only high-quality name brand professional products. Don’t waste time with cheap products you’ll only need to then repair. 9.) Incorrect preparation is the main cause of lifting. Before you begin, have your client wash hands and scrub her nail plates to reduce oils. 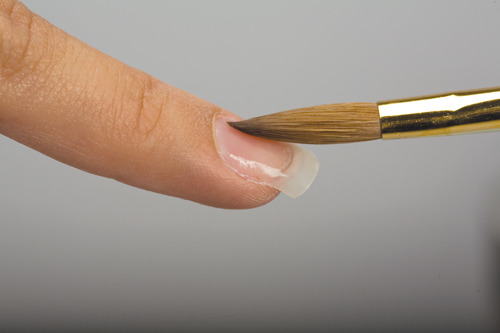 Push back the cuticle, lightly buff the surface (don’t use a file coarser than 180-grit), remove all the excess dust with a disinfectable nail or surgical brush, clean the nail with a lint-free wipe and nail prep solution, and apply the recommended primer. 8.) Follow the manufacturer’s instructions and keep like brands together. Don’t stray from the directions or skip steps. Don’t use one monomer liquid with another type of polymer powder – the chemicals in one brand may not mesh well those in another. 7.) Don’t let it flood! 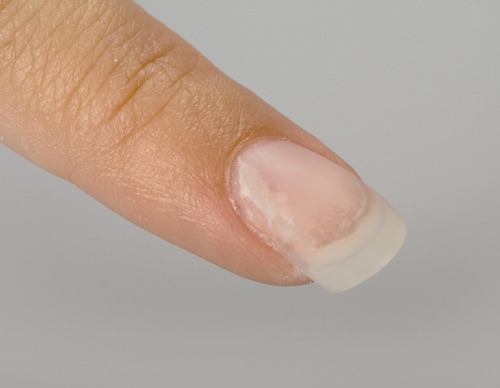 Leave a thin margin of at least 1/16th of an inch around the cuticle. However, don’t leave an “edge” that you can feel after filing – it may catch on something and pull the enhancement up. 6.) Avoid product contamination. Store your brushes in a clean, dry, covered container with the bristles pointed down. Don’t use soaps, detergents, or oils to clean or condition them. Clean your dappen dishes between clients and never leave them full overnight. Never pour monomer liquid back into the container. 5.) Build enhancements to an appropriate length. Don’t create nails that are way too long. The longest enhancement you could try should be half of the length of the natural nail bed. If your client asks for something longer, let her know that it won’t hold up as well to normal wear and tear. 4.) 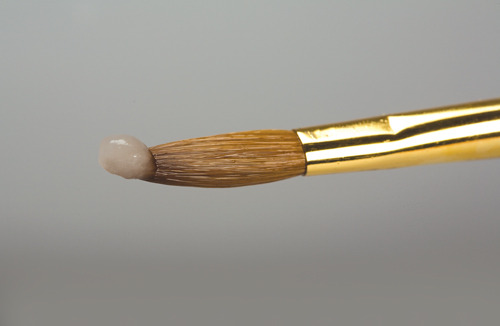 Use the correct mix ratio for acrylic. Balance is key. 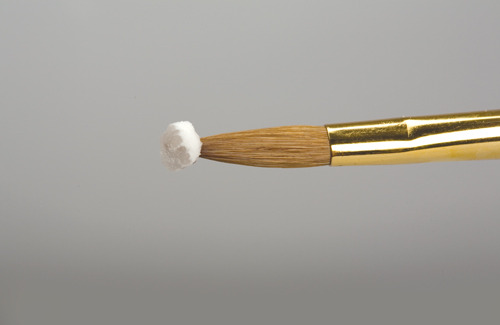 Here’s how to test: place a bead of product directly on the apex of a clean, unfiled acrylic nail tip. Do not pat or push it down, just observe it for ten seconds. If it’s too wet, it will settle and flow outward immediately or drop by half within those ten seconds, losing most of its original shape. If it’s too dry, the height and shape will be completely unchanged after ten seconds, be difficult to keep in place, and will look crusty. The perfect consistency will look like frosted glass. 3.) Stop nipping the old product off nails. It can cause more lifting and create a ledge that’s hard to incorporate into the new nail. 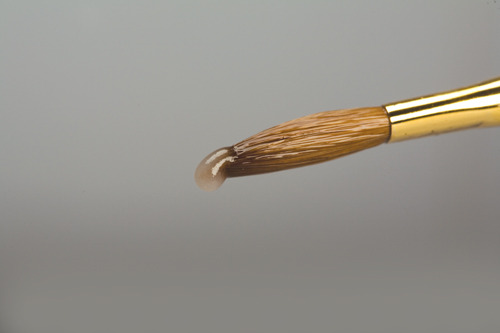 Instead, use a 180- or 240- grit file to remove the shine from the old product and lower its thickness by a third. Any lifted places should be filed away and blended into the natural nail. 2.) Hold a medical consult. Some medications and treatments affect nails and hair, causing lifting. If your client is one of these, try your best with different products (gels, wraps, acrylics), and see what works best. If nothing seems to help, recommend more natural nails. 1.) Educate your clients. Keep your clients knowledgeable of proper at-home care and maintenance.